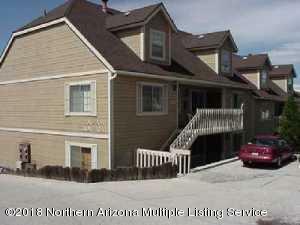 Great opportunity on this 3bed/2bath condo located just a short distance from downtown Flagstaff and adjacent to the Flagstaff Medical Center. Great second story end unit with large master on the main level, and two over-sized bedrooms upstairs. Comfortable and spacious, this is the perfect location for a vacation home, year around residence or investment property!